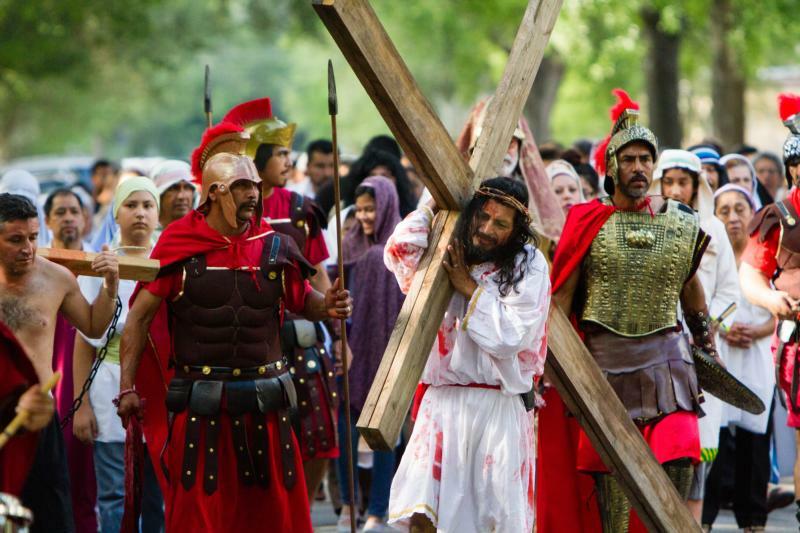 One of the most popular traditions among Hispanic Catholics in the United States is the “Via crucis viviente” or living Stations of the Cross on Good Friday. It is a reenactment of Jesus’ final hours and his journey to Calvary as said in the prayers and reflections of the Stations of the Cross. This tradition focuses on the suffering of Christ and gives an opportunity to bring our own sufferings to the foot of the cross and to harvest spiritual rewards as we celebrate his rising on Easter. The living Stations of the Cross is celebrated in Latin America and other countries such as Spain, Italy and the Philippines. In the United States, areas with large Hispanic immigrant populations have found in their parishes the support to continue sharing this tradition with their children and people from other cultures. Many parishes make it bilingual, and some bishops such as Michael F. Burbidge of Arlington, Virginia, and David J. Malloy of Rockford, Illinois, have also joined in this tradition, embracing the universality of the Catholic faith. What makes the living Stations of the Cross a deeply moving experience is that viewers will see a re-creation of Jesus’ last moments unfolding before their eyes as a reminder of the suffering and pain he endured on his way to the cross and for our salvation. They will visualize the bloody sweat on Jesus’ tunic, the crown of thorns on his forehead, they will see him fall three times while Roman soldiers scourge and mock him on the way to his crucifixion. As the scenes unfold and the procession follows, a priest or prayer leader will recite in Spanish the prayers corresponding to each of the 14 stations. The prayers are combined with traditional pious hymns such as “Perdona a tu pueblo, Señor,” or “Forgive your people, Lord.” The somber and reverent atmosphere invites silent self-reflection. Volunteers and coordinators say that people often do not feel prepared for the roles they are assigned, but they are moved by their faith and as they spend several weeks rehearsing and learning their lines, they also prepare themselves physically and spiritually, often through prayer and fasting. The experiences of the roles they play stay with them for a long time and even strengthen their faith, said Santiago Gomez, a volunteer at the Shrine of the Sacred Heart, in Washington, where he leads the Cristo Joven young adult group that every year performs a play of the Passion of Christ prior to the Stations of the Cross. In 2017 he performed the role of Jesus. At this location, the procession that goes along Mount Pleasant Street attracts hundreds of people. Some of those attending may not be regular churchgoers but will make time for this Easter triduum tradition, and oftentimes families of three or four generations show up to pray together. As they share in the suffering of Christ, they will also bring to the cross their own sufferings, whether it is an illness, loneliness, family separations, an uncertain immigrant situation or family troubles. On that day, none of their crosses seem as heavy as the one Jesus carried to Calvary. As we continue the celebration of the Paschal triduum on Good Friday, we unite ourselves to Jesus and accompany him on the way to Calvary, looking forward to celebrating once again with deeper joy and renewed hope and faith his rising on Easter Sunday. Montenegro Flynn is a freelance journalist and communications consultant in Washington.